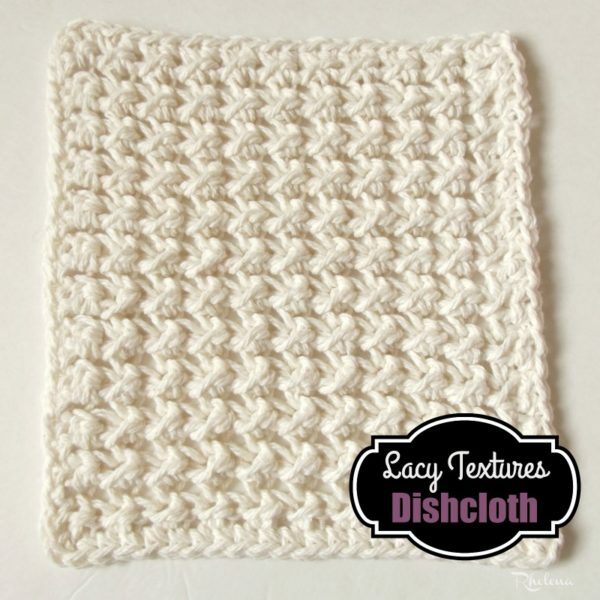 This lacy textured dishcloth crochet pattern is given in one size to measure about 6.5 by 7 inches, but in a simple multiple of two, you can increase or decrease this to any size you need for use throughout the home. It is easy to whip up a coaster and a placemat to match, and decorate your kitchen with this elegant looking stitch pattern. As for the stitch pattern, it’s done with the half double crochet and slip stitch in one row, and the single crochet and chain 1 in the next row to give it a nice lacy and textured fabric. The textured dishcloth not only looks great, but the textures are perfect for tough scrubbing needs, and the bit of lace helps for it to dry quicker after use. Best of all, it’s pretty enough for gift baskets! Crochet it in a solid color as shown, or mix and match and use up your left-over scraps. Either way, it’s sure to be loved by everyone. You might also enjoy this quick and easy crochet dishcloth or this crochet v-stitch dishcloth. Edging: With H hook, ch 1, sc evenly around working 3 sc into each corner st. Fasten Off. And be sure to check out the rest of the dishcloth pattern collection here: Free Dishcloth Crochet Patterns. This is a perfect little dishcloth. Love it! Do you work in the back bumps in every row? No, just for row one when working into the chains.